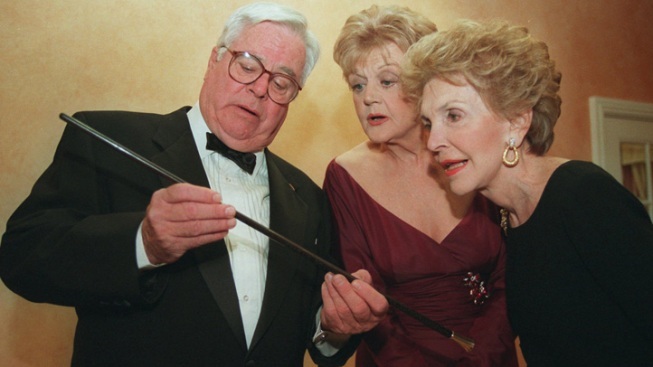 William Windom, pictured here with "Murder She Wrote" star Angela Lansbury and former first lady Nancy Reagan at the 1996 Caritas Awards, died of congestive heart failure at his California home. Rest in peace, William Windom. The television actor, who received an Emmy Award for his work in My World and Welcome to It and is well-known for his roles on Star Trek and Murder, She Wrote, died in his California home from congestive heart failure on Thursday, according to the New York Times. During his early years, Windom joined the army and served as a paratrooper in World War II. He later attended the University of Kentucky, among several other higher-education institutions, and decided to pursue acting. Windom also appeared on episodes of The Twilight Zone and the '60s comedy series The Farmer's Daughter, where he played a Minnesota congressman, a position served in real-life by his great-grandfather, whom he was named after. The award-winning actor also landed film roles, including a part in To Kill a Mockingbird, as the prosecuting attorney who faced off against Gregory Peck's Atticus Finch in court. Windom is survived by his wife of 37 years, Patricia, and four children, Rachel, Heather, Hope and Rebel.